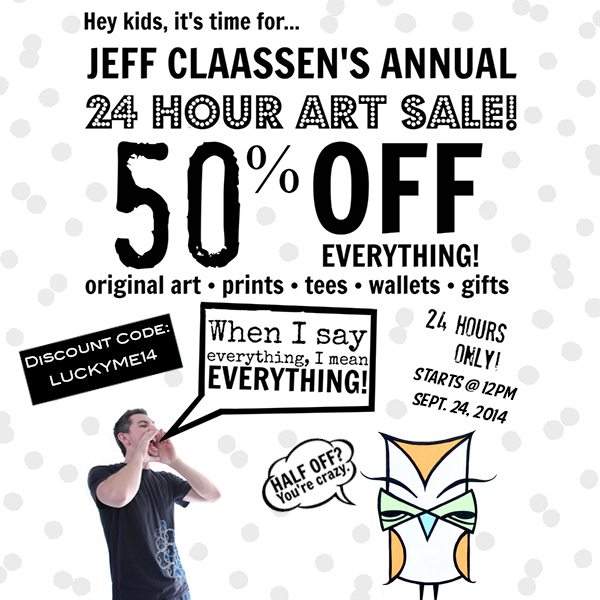 Hello and welcome to the 3rd Annual Art Sale! Receive 50% off EVERYTHING for 24 hours. This half off deal is my way of saying thanks to everybody that has supported me throughout the year whether it's buying artwork, following on instagram/facebook or just sending words of encouragement and helping spread the word. I appreciate all of it and it truly means a lot to me. This is the biggest sale I have of the entire year and it's the only time EVERYTHING in my online shop is 1/2 off. There are currently 189 items available. Everything from one of a kind originals to handmade wallets to t-shirts to limited edition prints, stickers packs, keychains and more. If you have any trouble please don't hesitate to ask for help. If you have any friends or family that might be interested in this awesome deal please feel free to forward this message or post about it on Instagram and Facebook. Copyright Â© 2014 Claassen Gallery, All rights reserved.